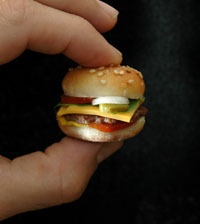 Forget super-sized fast food, how about some super-tiny fast food! A member of crafter.org and her husband created a super-small burger, fries and a coke... and then ate them. As she wrote with her creation: "Lots of people forget that cooking is a craft, nay an ART"
Check out her photos of the design, creation and cooking process for creating this tiny meal. It's pretty amazing.